It being the last day of January and the day before my Love month begins, I figured I'd better quickly post this list of books read this month. From here on in, it will be all love posts and love reviews until March! Get ready. I read 19 books in January. This is a partial list of books you can expect me to review for February - lots of YA romances there. I've really enjoyed a lot of them, but my favourites would have to be Anna and the French Kiss by Stephanie Perkins and Girl Meets Cake by Susie Day. There's still time to enter my giveaway to win copies of either Anna or Immortal Beloved by Cate Tiernan. It's open internationally. Look out for a giveaway of Girl Meets Cake coming soon. All of the books here have been read from my TBR shelves, which is excellent. Caught up with lots of review books as well. Review books: By Midnight, Need, My Name Is Memory, Eighth Grade Bites, Tyranny, Low Red Moon, A Beautiful Lie, The Iron King, Long Reach, and Siren. Just one book there bought second-hand in a charity shop (Push), one book recieved from the author (Girl Meets Cake), one book won in a blog giveaway (Anna and the French Kiss) and the rest bought new in a bookstore or bought new on the Internet. How did reading in January go for you and what are your reading goals in February? You must read Finding Sky. Loved that book to pieces. I wish I could read as fast as you! TSB - Ha. Love dovey smoochy posts :) Get ready. It's begun! Great month. 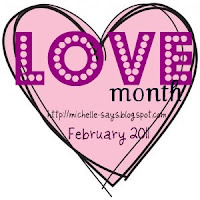 Looking forward to lovey dovey stuff in February!